This week marks the 20th anniversary of the 1994 IRA cessation. The Ireland of the early 1990s was a very different place. Political censorship and exclusion was the norm. Successive Irish governments worked with British governments in pursuing a negative agenda which merely fed the cycle of discrimination, resistance and conflict. Unionist leaders, supported by elements of the British and Irish establishments, opposed any dialogue between the British and Irish governments and republicans. However, by early August 1994, despite continued conflict, there was a feeling among republican leaders that we were driving forward a historic process of change. This had been years in the making. Indeed if we go back to when Fathers Alec Reid, Des Wilson and I started our discussions, over a decade had passed. Progress on developing the peace process had been made behind the scenes in meetings with John Hume. These later emerged as the Hume/Adams initiative. There was also progress with the Irish government. Martin McGuinness and I had given the IRA our assessment that there was a convergence of views between Sinn Fein, John Hume and the Irish government on a range of issues. We had achieved agreement on a number of important points. There was an acceptance that partition had failed; there could be no internal settlement within the six counties; the Irish people as a whole had a right to national self-determination; there could be no unionist veto over discussions or their outcome and any negotiated settlement required fundamental constitutional and political change. We also agreed that there were practical matters of immediate concern to nationalists in the North including parity of esteem, equality of opportunity and equality for Irish culture and identity. The Irish government had given written assurances that in the event of an IRA cessation, it would end its marginalisation of the Sinn Fein electorate and that there would be an early public meeting between taoiseach Albert Reynolds, John Hume and myself. To show that change was imminent, we worked to develop public manifestations of support for an alternative approach which might convince republicans to back a cessation. Irish America was key to this. The peace process was also now on the agenda of the Clinton administration. A powerful group of Irish Americans had committed to campaign in the US for an end to visa restrictions for republicans; establishment of a Washington office to inform the US media and public on the peace process; to lobby for investment in the North and for the US to act as guarantors of any agreements. The fledgling Clinton administration had indicated positivity. Events were now moving quickly. We had asked for a visa for Joe Cahill to travel to the US to brief Irish Americans on developments. This would test the Clinton administration’s commitment to the peace process in the face of what would prove to be strident British opposition. Fr Alec, US ambassador Jean Kennedy Smith, her brother senator Ted Kennedy and taoiseach Albert Reynolds spent long hours lobbying for a visa for Joe Cahill. On Sunday, August 28th, John Hume and I issued another joint statement making clear that agreement threatened no one. It was followed that evening by a statement from Albert Reynolds who said a historic opportunity was opening up and the British had a responsibility to respond on demilitarisation and inclusive all-party talks. On August 29th, in the face of strident British opposition, visas were granted to Joe Cahill and Pat Treanor to travel to the US. This demonstrated there would be a strong international focus in support of the Irish side in negotiations with the British. I reported to the Sinn Fein ard chomhairle that the final pieces of the jigsaw were coming together but we understood the ultimate decision on a cessation rested with the IRA. Martin McGuinness and I went to meet the IRA leadership again. Martin said the Hume/Adams initiative had given people hope, that more nationalists saw republicans making a real effort to build peace, that Irish nationalism was reasserting itself and that Sinn Fein was growing in strength. We made it clear that the struggle wasn’t ending and given that the political commitments made were multilateral and public that there was a better chance of delivery than with previous cessations. We argued that it was an opportunity to test the British government’s desire for peace and to reach out to unionists, who we had been meeting at civic, community and religious level for some time. I made clear that it was a high-risk strategy but that we had commitments from John Hume, the Irish government and Irish America was willing to play its part. We could set in place a process which created the conditions for a just and lasting peace and from there build a pathway to a new all-Ireland republic of equals. A formal proposal was put to the meeting and the IRA’s army council voted to give the process a chance. At 11am on August 31st, the IRA announced “a complete cessation of military operations”. As hundreds of people arrived for an impromptu rally at Sinn Fein’s offices in Belfast cheering their approval, I was struck by the awesome responsibility of it, with the hopes and aspirations of so many pinned on us delivering. The IRA cessation opened up the space for the development of the peace process. 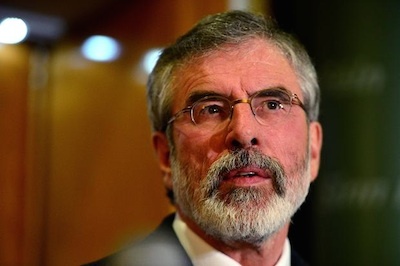 Enormous changes have come as a result of that decision by the IRA leadership. It was quickly followed by the loyalist ceasefire. It has had profound effects on politics in Ireland and in the relationship between Ireland and Britain. People rightly remember the great political highs of the past two decades, be it the achievement of the Good Friday agreement, the St Andrews and Hillsborough agreements, the decision of Ian Paisley to share power or the decision by the IRA to leave the stage. However, none of these or the other fundamental, political, social and constitutional changes which have been effected would have been possible without the difficult and risk-laden work undertaken by Albert Reynolds, Fathers Alec Reid and Des Wilson, John Hume, the Sinn Fein leadership and others such as Martin Mansergh, Sean O hUiginn, Niall O’Dowd, Ken Newell and Harold Good in the years before the 1994 cessation. Twenty years on there is an urgent need for the British and Irish governments to tackle outstanding issues bedevilling the political process in the North and which threaten the progress that has been made. The Taoiseach would do well to emulate the approach adopted by the late Albert Reynolds.